Now that my daughter is growing out of her baby-ghan, I started her a new ghan. We went to the store and she picked out the yarn she wanted. She chose a variegated pink, purple, blue, and green for the body. And a matching light purple for the border. I decided to copy a ghan my mother left me. It's a simple alternation of rows. 1 row all dc's. The next row 3 dc's, sc, skip 1 and 3 dc's. I'm sure I said that wrong, but you can understand from the pic. After doing 1.5 million dual yarn dc's for my son's flannel-ghan, I figured, no big deal. So, you can prob see my first mistake pretty easy. My base chain was off by 2 sc's and I did not pay really notice what I did until 8 rows in. Did not want to start over, so 1 side has 3 dc's on the side and the other has 1. 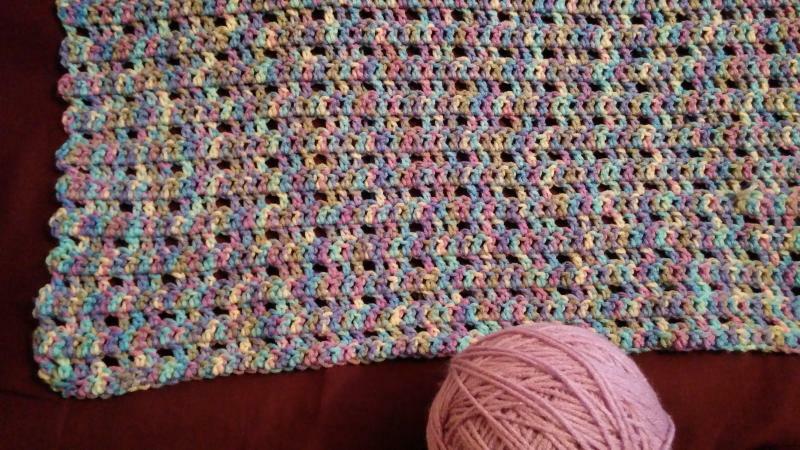 My question is, what type of border do I put on this ghan? I planned on just doing 2 or 3 circuits of dc around it. Just wondering if something else might look better. Second question I likely will ask wrong. When hooking into the bottom row for my dc's, I usually only grab 1 on the yarns not both. Studying my mom's ghan, she grabbed both. So, that's what I did with this ghan. I'm just wondering, does it make a difference? I was thinking it may make the small holes between rows seem smaller, but I can't see much difference. Is 1 way proper, or is it just a preference thing? I can see that going through both sure seems a beck of a lot easier. But that could just be because I still fluctuate in how tight or loose I make a stitch. re a border: I personally think that many afghans look great w/o a border and I think yours is good just as it is, so if I were making it i wouldn't put a border on it. 1. 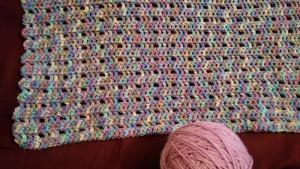 Do an sc edge in the variegated yarn. 2. Do 2 dc, 1 dc, alternating in every stitch. Add at least 2 extra dc in the corners. 3. For a longer ruffle, 1 dc around. 5 dc in each corner. When you say 'hooking into the bottom row', do you mean making the first row into the chain, and only using 1 loop of the chain? It usually doesn't matter, none are wrong, but.. There are 3 loops of the chain, and 3 ways that I know of to use the chain to start with (actually I can think of a 5, but I think the other 2 would be really awkward). None are wrong, they all work fine. 3) using the back bump of the chain. Plus, it looks like the other edge of the fabric. Minus, it can cause the edge to be tight, but easily fixed by chaining with a bigger hook than the project calls for, & switching to the right hook for the first row. Also, a little easier to see where to put your stitches if you are making a border around than the first method (but not much). Re: the border, I also think it looks nice as is, but a solid border, either flat or ruffled, would look nice too. Also might be a bit functional for a lacy pattern like yours, since blankets tend to get more stress at the edges, where we grab them. Not to mention it might disguise the assymetry..
Soooo, I asked my supervisor. She put her hands on her hips, looked at me like this was the most important decision she will ever make. Then said, "Ruffels. It should have Ruffels." God, they are cute at 4. Anyway, time to make a granny square with leftovers to see if she really likes it first. Going to try the one you said Redrosesdz. 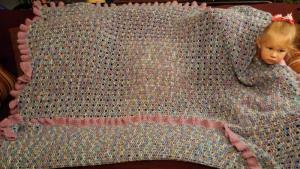 I'm kinda surprised that she did not want a lace edge like her baby-ghan. She is always playing with it. Any other ideas for reasonable ruffels? Here's a pic of the afghan I made for my granddaughter. 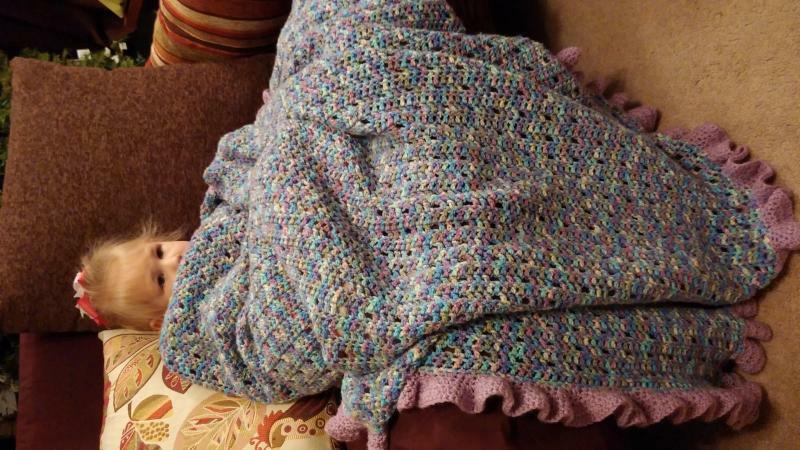 http://www.crochetville.com/community/topic/154000-purple-afghan. I made the ruffle as described above. I only have the one pattern for a ruffle. Maybe someone else has another one. Lots o'ruffles below to give you more ideas, Basically, a base row of multiple stitches into 1 (the more stitches you put into 1, the rufflier), then (optional) more plain rows after that. You could start with a solid DC base row to start the ruffle, then a couple of rows of the eyelet pattern to coordinate. Redrosesdz, I like your pattern of alternating increases with plain stitches, gives the ruffle a more formal/structured look. Thank you all for your help and advice. I think it turned out well, and she loves it. I should have taken a picture before I gave it to her. She will not let go of it. I'll get a pic when we wash it next. That is so cute! If she won' t let go of it, you definitely done good ! Actually, I love the pic of her underneath the blanket the best. She is holding onto it for dear life. That just says it all. It turned out adorable and your daughter is adorable, too! 3 years later, and she still drags it around the house and curls up in it. Glad I went through both loops and put the border on it. She has put it through a lot of use and it is not showing any signs of wear. Ever once and a while I see an end that I sewed in that peaks out, but no wear. I was worried for a while about those since I did not tie them in place. But I guess I don't need to worry any more. May have gone overboard with the 1' long tails though. But hey, they locked in. Awww, thanks for the update! This is a great story. It's so satisfying when a loved one, or anyone for that matter and no matter the age asks for something to be crocheted for them. Jason; I too worry over ends coming out and have not had many problems at all over the years. For the first time ever I used the Magic Knot on a scarf I just finished for my oldest DD. She promised to let me know if there is ever a problem with them coming undone. Maybe you would be interested in it for tails.